Please contact us by phone or email with inquiries about our racing events, racers, corporate events or birthday parties today and we will get back to you as soon as possible! 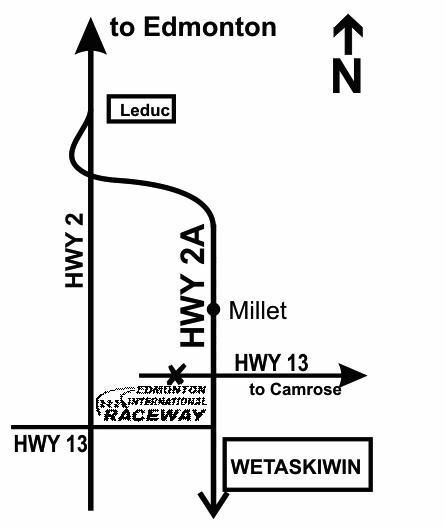 Head South on Hwy 2 from Edmonton and just past Leduc take the Hwy 2A Exit that goes to Wetaskiwin. Follow this Hwy (2A) for about 20 kms. (you will pass through a town called Millet) – keep going on the same highway. Just before you reach Wetaskiwin you will come to a set of stop lights – turn right (West) there and travel 4 kms. Down that road and you will come to the Race Track on the Left hand side of the road. 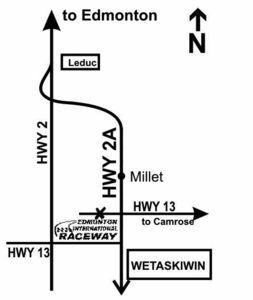 Head North on Hwy 2, take the Hwy 13 Exit (East) to Wetaskiwin. Travel down Hwy 13 until you come to Hwy 2A (Pioneer Chrysler on the right) – turn left at this set of lights, travel about 2 miles and just before you head out of Wetaskiwin turn Left (West) at the lights (the Montgomery Glen Golf Course is on your left) and travel down that road for 4 kms. And you will come to the race track on the left hand side of the road.